[V,Y] = filter(Mdl,Z) filters disturbances (Z) through the fully specified conditional variance model (Mdl) to produce conditional variances (v) and responses (y). Mdl can be a garch, egarch, or gjr model. [V,Y] = filter(Mdl,Z,Name,Value) filters disturbances using additional options specified by one or more Name,Value pair arguments. For example, you can specify presample disturbance and conditional variance paths. Specify a GARCH(1,1) model with Gaussian innovations. Simulate the model using Monte Carlo simulation. Then, standardize the simulated innovations and filter them. Confirm that the outputs of simulate and filter are identical. The logical value 1 confirms that the two outputs are identical. Specify an EGARCH(1,1) model with Gaussian innovations. Simulate 25 series of standard Gaussian observations for 100 periods. Z represents 25 paths of synchronized disturbances for 100 periods. Obtain 25 paths of conditional variances by filtering the disturbance paths through the EGARCH(1,1) model. 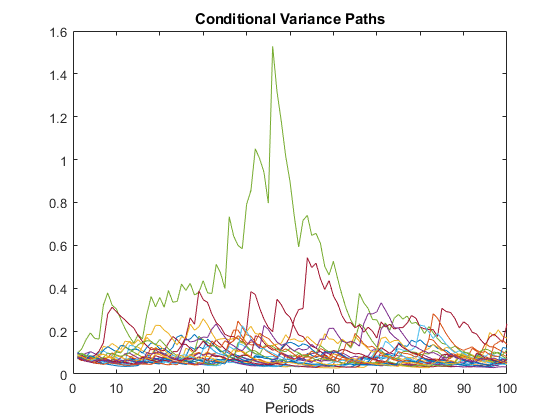 Plot the paths of conditional variances. Specify a GJR(1,2) model with Gaussian innovations. Simulate 25 series of standard Gaussian observations for 102 periods. Z represents 25 paths of synchronized disturbances for 102 periods. 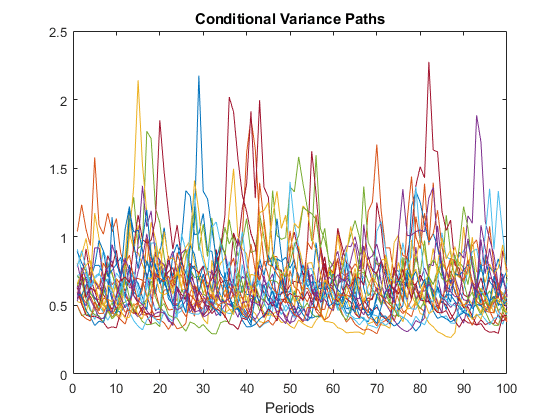 Obtain 25, 100 period paths of conditional variances by filtering the disturbance paths through the GJR(1,2) model. Specify the first two disturbances as presample observations. As a column vector, Z represents a single path of the underlying disturbance series. As a matrix, the rows of Z correspond to periods. The columns correspond to separate paths. The observations across any row occur simultaneously. The last element or row of Z contains the latest observation. NaNs indicate missing values. filter removes these values from Z by listwise deletion. The software removes any row of Z with at least one NaN. Removing NaNs in the data reduces the sample size, and can also create irregular time series. Example: 'Z0',[1 1;0.5 0.5],'V0',[1 0.5;1 0.5] specifies two equivalent presample paths of innovations and two, different presample paths of conditional variances. Presample disturbance paths, specified as a numeric vector or matrix. 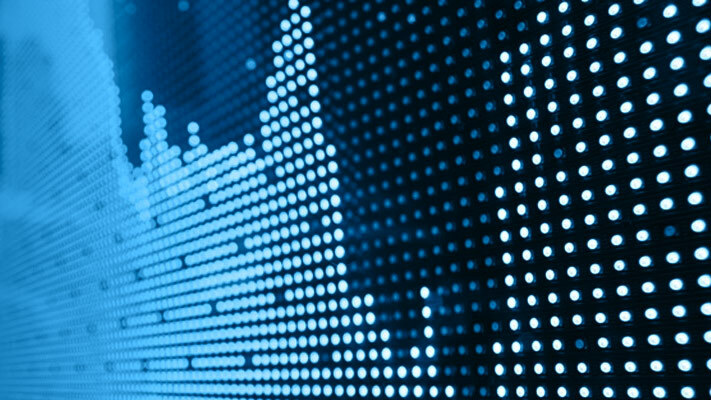 Z0 provides initial values for the input disturbance series, Z. If Z0 is a column vector, then filter applies it to each output path. If Z0 is a matrix, then it must have at least as many columns as Z. If Z0 has more columns than Z, then filter uses the first size(Z,2) columns only. Z0 must have at least Mdl.Q rows to initialize the conditional variance model. If the number of rows in Z0 exceeds Mdl.Q, then filter uses the latest required number of observations only. The last element or row contains the latest observation. By default, filter sets any necessary presample disturbances to an independent sequence of standardized disturbances drawn from Mdl.Distribution. Positive presample conditional variance paths, specified as a numeric vector or matrix. V0 provides initial values for the conditional variances in the model. If V0 is a column vector, then filter applies it to each output path. If V0 is a matrix, then it must have at least as many columns as Z. If V0 has more columns than Z, then filter uses the first size(Z,2) columns only. V0 must have at least max(Mdl.P,Mdl.Q) rows to initialize the variance equation. If the number of rows in V0 exceeds the necessary number, then filter uses the latest required number of observations only. By default, filter sets any necessary presample conditional variances to the unconditional variance of the process. NaNs indicate missing values. filter removes missing values. The software merges the presample data (Z0 and V0) separately from the disturbances (Z), and then uses list-wise deletion to remove rows containing at least one NaN. Removing NaNs in the data reduces the sample size. Removing NaNs can also create irregular time series. filter assumes that you synchronize presample data such that the latest observation of each presample series occurs simultaneously. Conditional variance paths, returned as a column vector or matrix. V represents the conditional variances of the mean-zero, heteroscedastic innovations associated with Y. The dimensions of V and Z are equivalent. If Z is a matrix, then the columns of V are the filtered conditional variance paths corresponding to the columns of Z. Rows of V are periods corresponding to the periodicity of Z. Response paths, returned as a numeric column vector or matrix. Y usually represents a mean-zero, heteroscedastic time series of innovations with conditional variances given in V.
Y can also represent a time series of mean-zero, heteroscedastic innovations plus an offset. If Mdl includes an offset, then filter adds the offset to the underlying mean-zero, heteroscedastic innovations. Therefore, Y represents a time series of offset-adjusted innovations. If Z is a matrix, then the columns of Y are the filtered response paths corresponding to the columns of Z. Rows of Y are periods corresponding to the periodicity of Z.
filter generalizes simulate. Both function filter a series of disturbances to produce output responses and conditional variances. However, simulate autogenerates a series of mean-zero, unit-variance, independent and identically distributed (iid) disturbances according to the distribution in the conditional variance model object, Mdl. In contrast, filter lets you directly specify your own disturbances.